Streetbees has appointed Sam Lowe as its first Chief Technology Officer; and says it will build 'the world's largest store of data about human behaviour... to rival even that available to Google or Facebook'. The company has recruited more than one million users - or 'bees' across 150 countries worldwide to use its chat-styles app to share videos, photos and text from their daily lives. Advanced natural language processing is used to analyse what they do, why they do it, and what they may do next. The firm's Always ON product provides customers with a live stream of user data constantly updated. This is now being further developed using artificial intelligence to create an 'automated and dynamic knowledge system and service that will deliver breakthrough insights and understanding from human-provided data'. Lowe will lead product design, development, data science and engineering for this task. He joins from Your.MD, an AI-powered health and medical service for pre-primary healthcare, where he was CTO and Head of AI. Before this he led a technology-based revamp of luxury UK fashion retailer matchesfashion.com , creating a global digital business. He was previously part of the team that set-up Hive, and he founded and led consultancy Capgemini's UK Digital Technology practice. 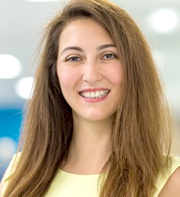 Founder and CEO Tugce Bulut (pictured) comments: 'Our mission at Streetbees is to make human data accessible, anywhere in the world. To that end, we are now building a knowledge system of human behaviour, which will in time hold even more information about how we behave than Facebook or Google. Sam's experience and ability to develop and scale commercially-focused AI platforms will help turn that vision into a reality'.